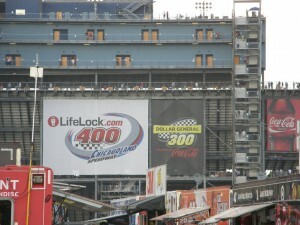 Restaurants over Tailgating for Chicagoland NASCAR | Have Game? Will Travel! Anybody who has been to a NASCAR race knows tailgating is a must. However, since I was attending the race by myself and it was hot outside I chose to go to a couple of bars/restaurants before the race. Even though I have never attended a race at Chicagoland Speedway, I have been to Route 66 Raceway several times for NHRA drag racing. Thus, I knew there was at least one place to go before the race. 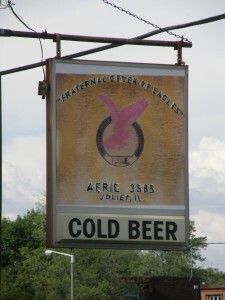 The first place I drove by was Fraternal Order of Eagles which was a total dive bar. FOE is located at 2019 S. Chicago St. just across from the Chicagoland Speedway. Since this place is technically a “club,” the door was locked so I could not just enter. I knocked on the door and the bartender let me in. At FOE I asked what other bars were in the area and they recommended Mr. B’s Bar & Grill on Route 66 located at 23956 State Route 53. It seems close but is actually about three miles south on Route 53. Mr. B’s Bar & Grill was excellent. First, they served food. Second, they had PBR and Miller High Life drafts for $1. Third, they had air conditioning. This was the perfect place to avoid the heat of tailgating. If you only have a few people attending the race going to Mr. B’s Bar & Grill is a great alternative. This place should start running a shuttle to and from the track on race days in the future. While I was eating dinner, I was talking with another patron and it turned out he had an extra ticket. The ticket’s face value was $96 and he wanted $50. I would have paid that but I counter offered $40 and he accepted. And, it turns out I received a good price. A few minutes later another fan walked into the restaurant and had two extra tickets. He wanted $60 for $78 face value tickets and sold them. Parking at Chicagoland Speedway is free, but when arriving late you will have to park on the opposite side of the track from where the entrance is located. One guy at Mr. B’s wanted a ride to the track and rather than parking for free opted to pay $10 to be in a lot that was closer to the main entrance. The walk was still pretty far, but since I was not paying it was hard to argue. We arrived at the track as Jim Cornelison (who sings the national anthem at Chicago Blackhawks games) was singing the national anthem. And, as they did a few weeks ago at Wrigley Field, the crowd cheered throughout the song as they do at the United Center. The seat I bought was amazing. I was in the 42nd row near the finish line. I could see the entire track which is a must at any race (although has not always been the case at races I have attended). Jimmy Johnson, who led the first 92 laps of the race, missed the entrance to pit road on Lap 93 and spent the rest of the race playing catch-up. On Lap 136, he spun out on the backstretch and brought his car into the pit on Lap 169 after running his car into the wall. All of this caused him to finish 25th. In the end, David Reutimann won his second career race as he edged out Carl Edwards, who finished second, and Jeff Gordon who finished third. Gordon who started his 600th race Saturday night also led 47 laps late in the race.